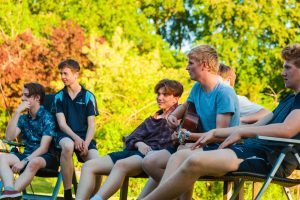 Really we should talk about Clayesmore School as a whole, not Clayesmore Senior School and Clayesmore Prep, as it is a coalescent being nurturing boys and girls all the way from 2 to 18 – but there is so much to see here that we’ve chosen to do two reviews! 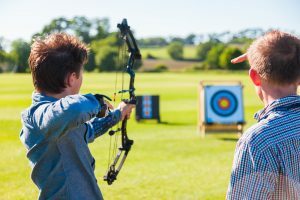 Clayesmore Senior is a co-ed boarding and day school for kids aged 13 to 18 in stunning grounds a few miles north of Blandford Forum and a step further from Salisbury, Bournemouth and Poole. It was founded in 1896, having moved to the West Country from Middlesex in 1933, via a stint in the buildings that are now Pangbourne College and Winchester. 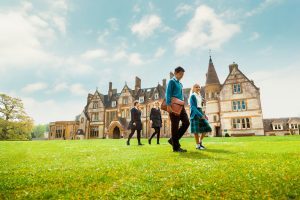 There is a small yet impressive Prep School on site, acres and acres of playing fields and parkland and, with 450 pupils (plus 210 in the Prep), it makes for a lot of space per child. 50% of children board in the Senior School and the nurturing, family feeling is strong. 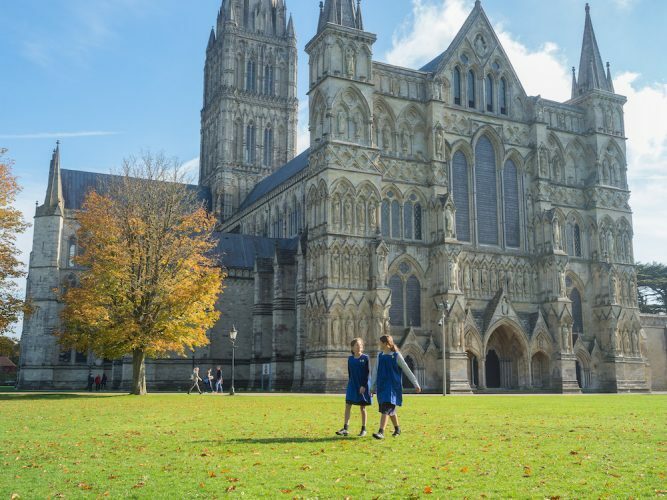 A significant proportion of children have moved up from the Prep (about 90% stay on at 13), with others arriving from local schools as well as Wiltshire and Dorset Prep schools, including Sherborne Prep, Port Regis, Sandroyd, Castle Court, Dumpton and Knighton House. Not surprisingly, the facilities are top notch here. Tennis courts, a full-sized astro pitch, contemporary dance studio and a large sports centre with squash courts, sports hall for badminton, volleyball and basketball, a swimming pool and fitness suites. Endless sports pitches enjoy a view of the stunning school building and parkland beyond. Unsurprisingly, sport is taken seriously here, with the 1st Netball team as county champions, Cricketer Magazine naming it as one of the top 100 schools for cricket in the country, frequent Wisden accolades and other top teams holding their own against local neighbours Canford School and Bryanston. Saying that, the school prides itself in embracing the triers and regularly fields teams above and beyond the high-flying firsts and seconds, with the ethos that sport is fun! The library is situated in the main house and is, unsurprisingly, lovely, large and bright; the DT block is impressive and the theatre is large and purpose built, hosting at least two plays per term (there is real encouragement of the students to pen their own dramas, and in Year 10 students write their own plays, pitch them to a panel and, if chosen, go on to direct them. Last year’s stand-out piece was a Murder Mystery Dinner Party, staged during a real dinner in front of the parents). The Art Department (situated in the local village of Iwerne Minster) welcomes all students, with regular Drawing Days and cultural trips to Pitt-Rivers museum and the Ashmolean in Oxford, The Victoria and Albert Museum, Tate and National Galleries and many students heading off to study the subject at University. The Music Department easily rivals Clayesmore’s competitors, with a school orchestra, Choral Society, Concert Band, Chapel Choir, Horn Quartet, Bassoon Quartet, Bagpipe Band (I fancy being in that one), all led by an inspirational Director of Music who has really set fire to the department. 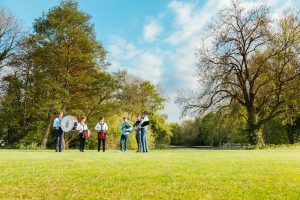 Concerts take place almost weekly and there is at least one major concert each term, with some smaller, more intimate events held in the Main House and other larger festivals in the chapel or on the lawns. 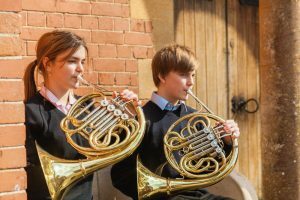 Two pupils went on to study music at conservatoires this year. Want to know the list of activities on offer? Are you sitting down? Ani-medics, archery, ballet, barbershop group, bush craft, chess, clay pigeon shooting, ClayesCOM (student radio station), climbing, cookery, croquet, cryptography, drone building, film making, Glee Club, Japanese, kayaking, Lego club, military history, mountain biking, life guarding, pottery, puzzle solving, sub aqua, Taekwondo, university cooking, water polo and yoga….and that’s just the start. I definitely came away thinking that this is a school where you can have a lot of fun while learning! Opportunities continue with CCF, Duke of Edinburgh Awards, Young Enterprise and Model United Nations all big deals in the Clayesmore community. Clayesmore is proudly non-selective and caters for all abilities. Having said that, there’s no slouching when it comes to academic progress. 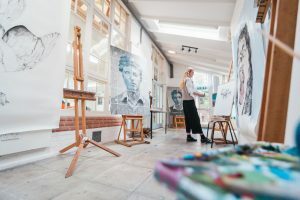 The school is forward-thinking and if you look at the results, all students end up at their first choice of university, college, drama school or degree apprenticeship. Small class sizes mean pupils get as good as one-to-one attention and so follow a steep gradient of academic improvement during their time at the school, even with the majority of subjects taught in mixed ability classes. 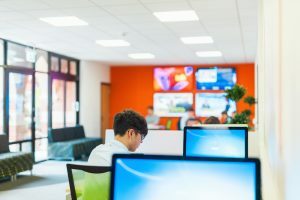 What is obvious is that education is tailor-made here, with all pupils offered a bespoke package of their choice and the school knocking away at the shrinking stigma of BTECs. 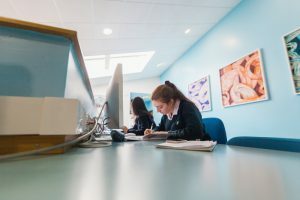 While all pupils take GCSEs, in the Sixth Form A-Levels are on offer but many pupils take both A-Levels plus one or more BTECs (or all BTECs if you are more practically-minded), which more and more universities view as a huge strength – even the most academic colleges are starting to prefer a blend of both. At Clayesmore it is not unusual for pupils to take extended BTECs (equivalent to 2 A-Levels) and achieve Distinction *. 50% of pupils at the Senior School board and although pupils are welcome to go home on Saturday nights, it doesn’t empty out at weekends. 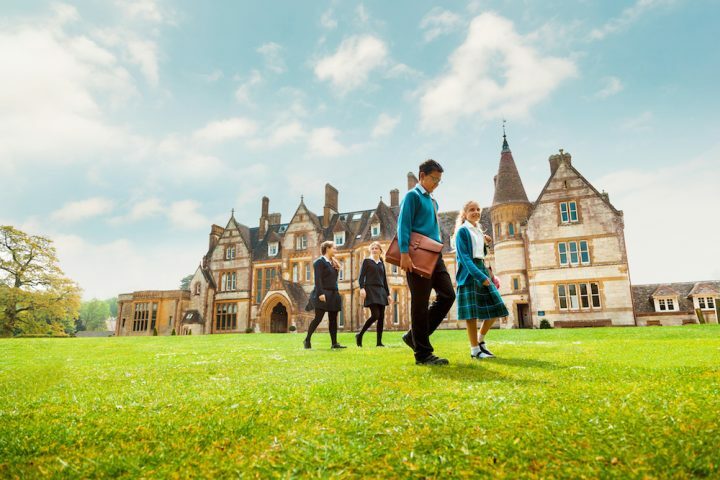 There are not a huge number of overseas pupils but enough full boarders make it feel like a proper boarding school, with a myriad of trips and activities on offer – think shopping trips to Bath and Bournemouth, tuck runs to the local supermarket, table tennis competitions, pizza and movie nights, cinema trips or just some much needed down time. 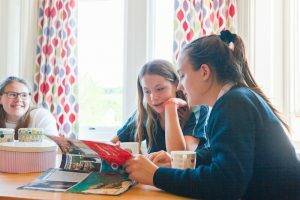 Many day pupils stay on for tea, prep and clubs in the evenings – as late as they like, really – and can even join in at weekends. Five relaxed and homely boarding houses (3 boys’ and 2 girls’) accommodate the children, with day pupils being allocated a house rather than being plonked in a separate Day House. 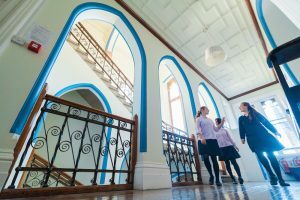 The relationship between day and boarding pupils seems seamless, and if you do choose to board I’d plump for the impressive girls’ space in the Main House – such lovely large rooms with original features, high ceilings and picture windows with views across the park. It even has a large, fully-stocked kitchen where I understand regular baking sessions take place! Jo Thomson is the woman at the helm here (I can’t believe how rare it is to have a woman as head of a co-ed school) and she is a pretty inspiring figure. 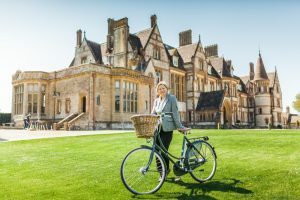 In her third year in the role, previously deputy for 8 years at Christ’s Hospital School (of the white collars and knee breeches fame), she is proud to say that it was Clayesmore’s ethos that brought her here – and that, with its non-selective basis and nurturing family feel, it is everything she thought a school could be. Although no longer teaching, she spends much of her time with the students and is a regular fixture on the side lines supporting Saturday matches. Indeed, her pride in the school and pupils is visible. There is a real mucking-in vibe at Clayesmore, and both students and faculty seem open and interested in new ideas. The sense of family prevails, with older children looking after younger ones and the Sixth Form definitely not being too cool to talk to first years. Everyone knows everyone, and it is not unusual to see older pupils supporting sports matches – and not under duress! The support of the individual runs throughout the school, from finding an unusual activity for a child to get stuck into, to researching and offering a new BTEC. Of course there are some fabulously quirky elements too – on the social calendar is a Monte Carlo-themed ball for Years 11-13, the House Music Competition is taken very seriously by all, and the list of trips on offer includes everything from the expected sports tours to Sri Lanka and South Africa, to language trips to Biarritz, Kaarst and Granada, work experience in factories overseas and expeditions to Everest Base Camp, just…well, because it’s there. Service is important, with pupils helping out at The Forum School, a local school for children on the Autism Spectrum Disorder, playing The Last Post at the village Remembrance Day service, doing community work at Kingston Maurward gardens, or helping out in Clayesmore’s Nursery or the Prep School, coaching sports and providing reading support. Not only does this help others but it instills a sense of self worth in the children – that it is not just about doing well that is important, but contributing to your community and helping others is vital in ensuring they develop into outstanding, broad individuals. 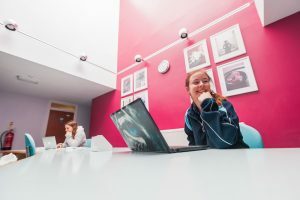 The not-too-big, not-too-small size of the school means that it can offer a range of subjects and activities to suit everyone, yet maintain that oh-so-important family feel. I came away with a strong sense that this is a kind, forgiving school, where everyone gives it a go. Everybody is known and has their space, and while strong academic foundations are clearly important, they prioritise building confidence, enabling children to reach goals they’d never dreamed off, and seizing opportunities, so a bright child will thrive and a less able one soar. Day fees are £8,740 per term, boarding fees £11,910 per term. ‘There’s nothing I think they fail on,’ says one parent. ‘In my opinion, they’ve got it right.’ ‘Clayesmore was the best decision we have ever made,’ says another, ‘and has, without a doubt, given Will a tremendous start in life.’ I expect that says it all. Good for: A school that caters for all abilities in a non-selective setting. A forward thinking, go-getting ethos that genuinely values the individual, and a happy family atmosphere. Oh, and the kids tell me the food is good! Not for: Parents who want a singular fast-track to Oxbridge. Dare to disagree?! Be my guest! Their next Open Morning is Saturday 2 March but if you can’t wait that long (I wouldn’t!) please call Rhona on 01747 812122 or email admissions@clayesmore.com. Want to know more about the Prep School and Pre-Prep? Check out our Muddy review here.